Rob Howley says the result of Saturday's World Cup warm-up between Wales and Ireland is important in the build-up to the tournament. Wales have chosen a team including four uncapped players to face the Irish at Cardiff's Millennium Stadium. 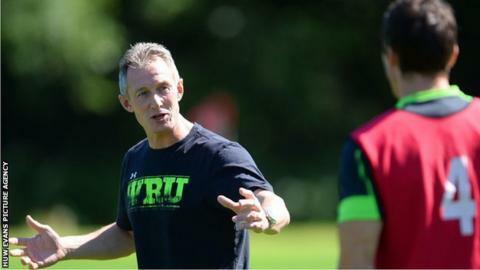 It is the first of three Wales games before the World Cup, and backs coach Howley says the result is a key factor. "The scoreline gives players confidence, momentum and the ability to play," he said. "Whenever you play, whether the 10th minute, 15th or 25th everything you do is based on the clock and the scoreline." As well as giving the team impetus into the second friendly against Ireland in Dublin on 29 August, Howley says the score will influence the performances of key players. "If we're leading 12-0 or losing 12-0 then the score has an influence on what you do with the ball at that moment, and collectively going in to the next games," added Howley. Ireland have made 13 changes from the starting line-up in their last international match against Scotland in the 2015 Six Nations championship. However, there are no uncapped players in their starting XV. Ospreys wing Eli Walker is one of the four Wales players due to make their debut on Saturday. The 23-year-old was selected to play against South Africa in November 2013, but pulled a hamstring during Wales training two days before the game and has been hampered by injuries ever since. Howley believes Walker can have a big impact. "One thing about international rugby you've got top have pace which he's got in abundance," said the former Wales and British and Irish Lions scrum-half. "He's got an x-factor, he can beat players on a sixpence. "It's him getting in the game as often as possible - that's something that we talk about whether it's Eli or Hallam [Amos] or Alex [Cuthbert] or George [North] when they get the ball they're very dangerous they can create opportunities for us. "I think for Eli it's always going to be looking for his first positive touch either in defence or attack and he can create something or finish off what we create." Wales will trim their squad from 46 to "36 or 38" after the first Ireland match, but Howley says the team comes before individual performances. "It's about facilitating the team," he said. "They want to play well individually but rugby is about playing as a team - we'll be much stronger as a unit. "It's very exciting, particularly when you look at all the young players that have come in that haven't had the opportunity to play in front of 70-odd thousand people at the Millennium Stadium. "It will certainly bring a different mental pressure to them which they are not used to and that's what we need to find out - they've worked so hard in the last - I think this is our eighth week - and we've stuck to our principles in what we have to work on. "We're looking forward to the game as a coaching team and equally for the players it's an opportunity for them under the pressure of the Millennium Stadium, which is going to be a similar ingredient to Rugby World Cup."